Since our earlier visit to the monastery library, I’ve been thinking about how “bits of books” have stuck to me through my lifetime. Not just quotes and ideas: but also emotions, atmospheres, examples in the face of trials. I learned the joy of “merging into a book” in childhood. I read about caves and wanted to explore one, read of a dog and wanted to have one. And surely I was not the only girl to see an abandoned house and picture myself as a fearless Nancy Drew venturing inside it, oblivious to cobwebs and pitfalls and bats. There is something besides mere enjoyment at work, however, when we read God-inspired books about God-centered lives. The Holy Spirit (particularly when we ask Him to do so) can use what we read to call us, personally, to give our hearts more totally to Christ. Have you ever read a book by a saint, and yearned to love God with that person’s total abandonment? Have you ever finished a powerful testimony only to find that the zeal and power you’ve read about has not yet finished with you? Monastery libraries do not contain “just any books.” They hold volumes whose contents will leave desires for virtue and charity and courage sticking to their readers. 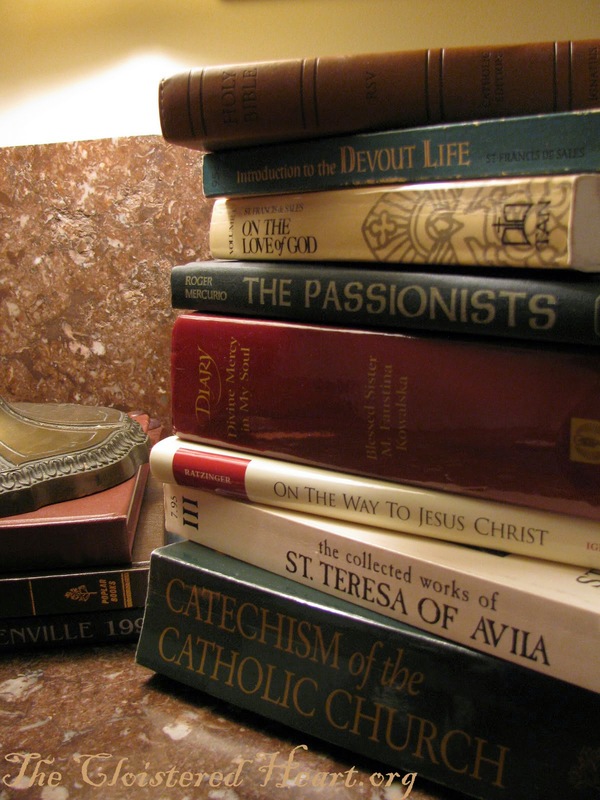 As a cloistered heart, I want to choose carefully what bits of books are sticking to me. What follows is the tiniest sampling of thoughts that have stuck to my spiritual bones over the years. These help arm me with zeal and courage. They have been used by God to make me a bit more fearless. They help me find strength to move forward, even in the face of life’s “cobwebs and pitfalls and bats”…..